Looking for an inexpensive, reusable accessory for your Christmas presents? 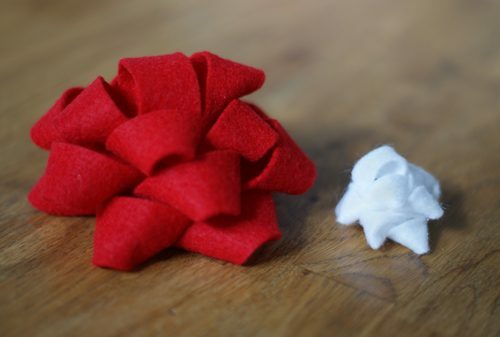 These DIY felt bows are so simple to make and can be used again and again! And really, once you know how to make a bow, you could make it out of any material…magazine pages, scrapbook paper, burlap, etc. 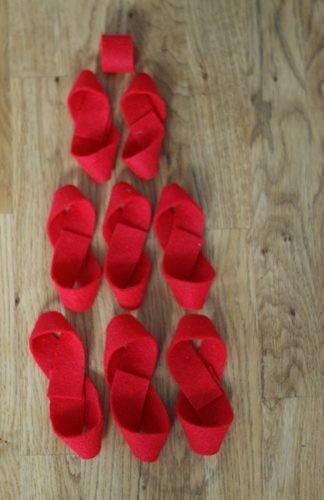 Cut strips from your felt. For the larger bow, use 3/4″ strips; for the smaller bow, 3/8″ strips. Cut your strips into the following lengths: (3) 9″, (3) 8″, (2) 7″, (1) 3″. Or for the smaller bow: (3) 4″, (2) 3.5″, 1 (1.5″). Twist your bows like the photo above one at time, gluing and setting them aside to dry while you do the rest. Be sure to use a fabric glue that will hold the felt. I bet you could even use hot glue in a pinch! Once all of your loops are ready, begin piecing them together, largest to smallest, gluing them one on top of the other so that the loops are evenly spread. Let dry and then attach to a package with glue or strong tape. Variations: Use multiple colored loops in a single bow or an entirely different material altogether! Thank you Mandi for the instructions. These felt bows are so lovely!!! I shared your tutorial as part of my Handmade Holidays project (http://sas-does.blogspot.com/2011/11/b-is-for-bows.html), hope it’s OK with you!